Back in the cooking saddle after being completely pampered at Lokal's Supper Club last night, we traveled to the Cape Verde islands via tabletop tonight with two savory dishes and one sweet. Cape Verde is an archipelago comprised of ten islands off the coast of western Africa. Before being discovered by Europeans in the mid 15th century, the islands were uninhabited; then they became a Portuguese colony and a stronghold in the Trans-Atlantic slave trade. The Cape Verde cuisine is mostly based on fish, beans, and rice. And in that vein, I selected Jagacida, a traditional Cape Verdean recipe for beans and rice flavored with smoked paprika, and Caldo de Peixe, a one-pot stew of fish cooked with a mixture of fruits and root vegetables. Heat the partially drained beans in a pan, seasoning to taste with smoked paprika, freshly ground smoked sea salt and freshly ground flower pepper. Stir in the rice. Keep warm till ready to serve. The traditional recipe called for moray eel or grouper; I had fresh salmon, so I used that. And I didn't fry the fish, I let it steam in the stew. 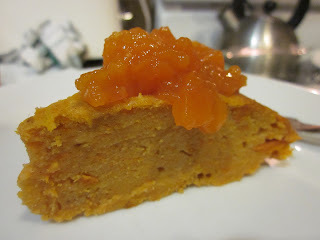 I substituted breadfruit for cassava and butternut squash for pumpkin. And I skipped the tomatoes. Add a little oil to a large pot and cook the onions and garlic until browned and aromatic. Add the bay leaves, breadfruit, potatoes, sweet potatoes, plantain, and butternut squash. Cook for 5 minutes, stirring constantly. Pour in the broth and bring to a boil. Reduce to a simmer and cook until everything is soft. Lay the cubes of fish on top of the stew, cover, and steam until cooked. Gently fold the fish into the stew and serve hot, over rice and beans. Place the sugar and water into a saucepan. Bring to a boil. Cook over medium heat until a thick syrup forms, approximately 5 minutes. 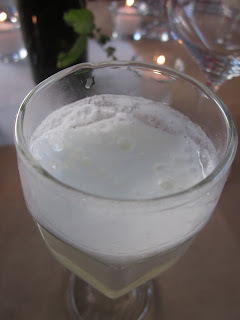 Whisk in the goat cheese until it is melted and the syrup is milky. Let cool slightly. Then whisk in the eggs, one at a time. Pour mixture into a buttered baking dish and bake in a 350 degree oven until the custard is set. Cool. Slice into wedges and sprinkle with more sugar before serving. This Knight of the Global Table Adventure is signing off for now. We're moving through the 'C's now. Stay tuned for the Central African Republic. Tonight my adventure was not something that I cooked. 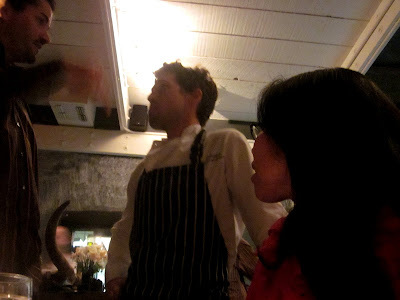 I just got to be the culinary paparazi, well-fed culinary paparazi. 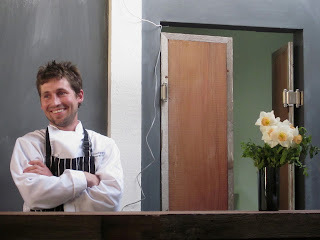 Jake and I went to a pop-up supper club, Edible Monterey Bay magazine's inaugural, for a slightly belated anniversary dinner; Brian and Pia joined us for the fun and food. Lokal, in the heart of Carmel Valley village, is the soon-to-be-opened brainchild of local boy Chef Brendan Jones. Click here to read the article that appeared in Edible Bay Monterey last August about the hip, elegant, but unfussy new restaurant. Did I mention "soon-to-be-opened"?!? We are the first people to eat in this restaurant that, for sure, will be a hit. 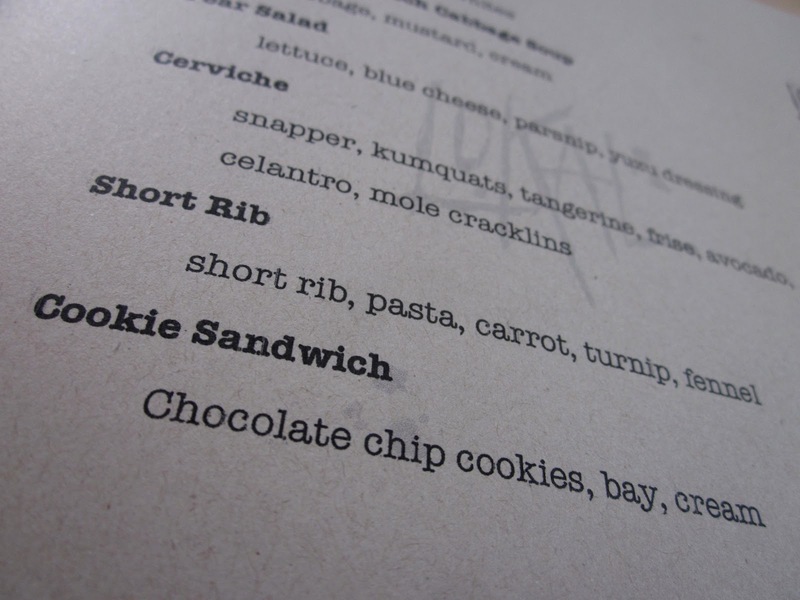 This prix-fixe menu consisted of six surprising courses. By "surprising" I mean innovative and delightful. Surprising. 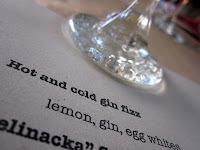 The first course: Hot and Cold Gin Fizz - lemon, gin, and warmed egg whites. Herby and zesty topped with a frothy mouthful of soft meringue. Wow. I have never had anything like this. The two things that stopped me from downing this apertif in two gulps - I wanted to savor every sip and I was drinking on an empty stomach. The second course was a nod to Brendan and Matthew Zolan's other business, a bar in Praque. 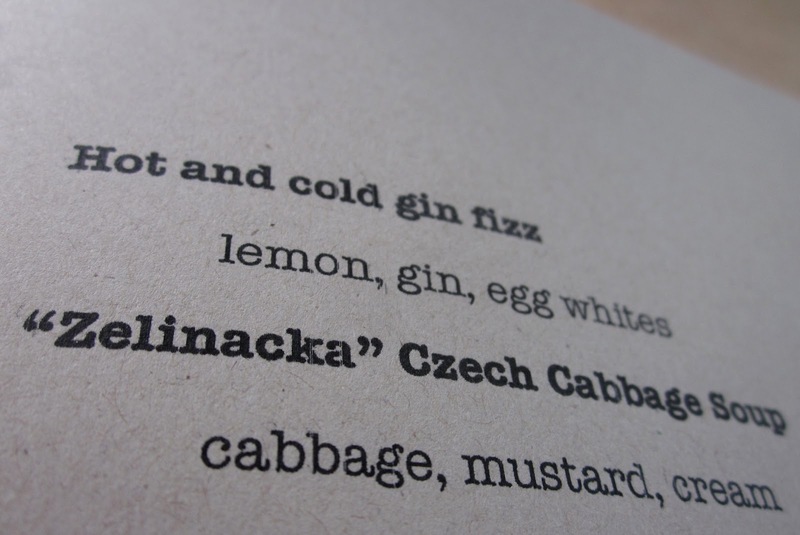 They served a Zelinacka Czech Cabbage Soup next. 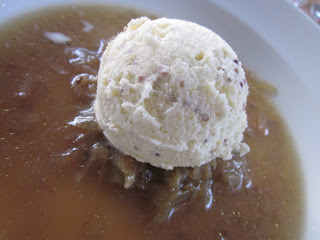 Cabbage soup topped with a mustard ice cream continued the hot-cold thing. Delicious and surprising. I need a new word. 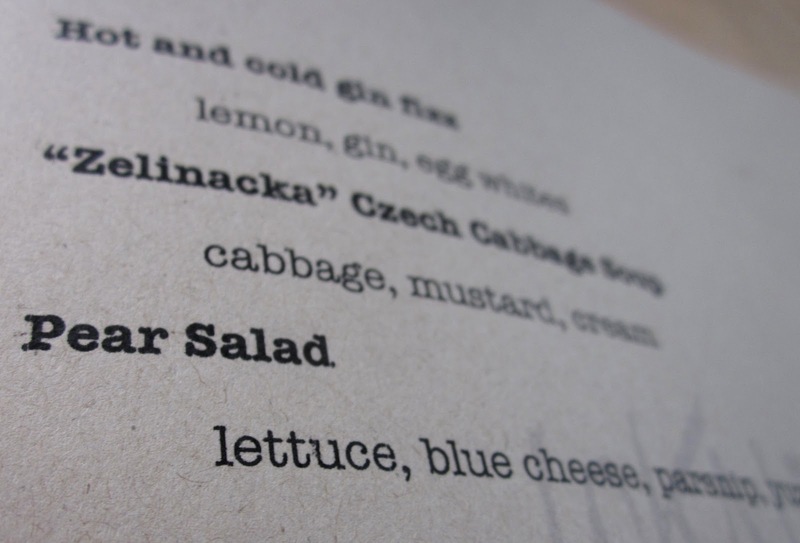 But, truly, cabbage cooked in a savory broth topped with a mustard seed-flecked scoop of ice cream is surprising, isn't it?!? They paired this with a pinot noir from the Chock Rock Vineyards. From soup to salad...the third course was a Pear Salad, local artisan greens topped with fresh pears, crisped parsnips, dressed with a sweet Yuzu dressing, and accompanied by a bleu cheese foam. I had to look up yuzu; it's a Japanese citrus fruit. 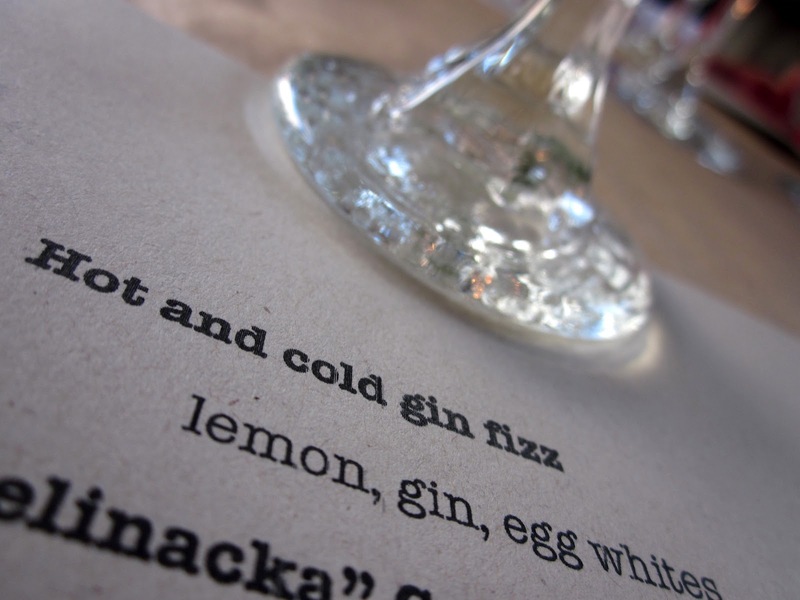 I love learning new things...and discovering new flavors. So fun. This was served with a chardonnay by Chock Rock. The fourth course was a Snapper Ceviche served with fresh avocados, kumquats, cilantro and crisp mole chips. 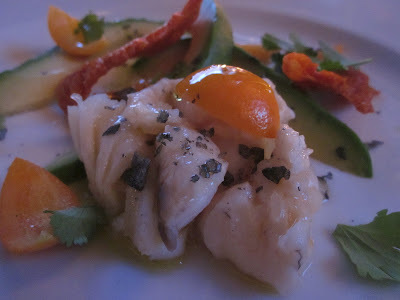 Tangy and light, this was matched with a vermentino by Chesebro Wines. Though everything was over-the-top amazing, this was my personal favorite. 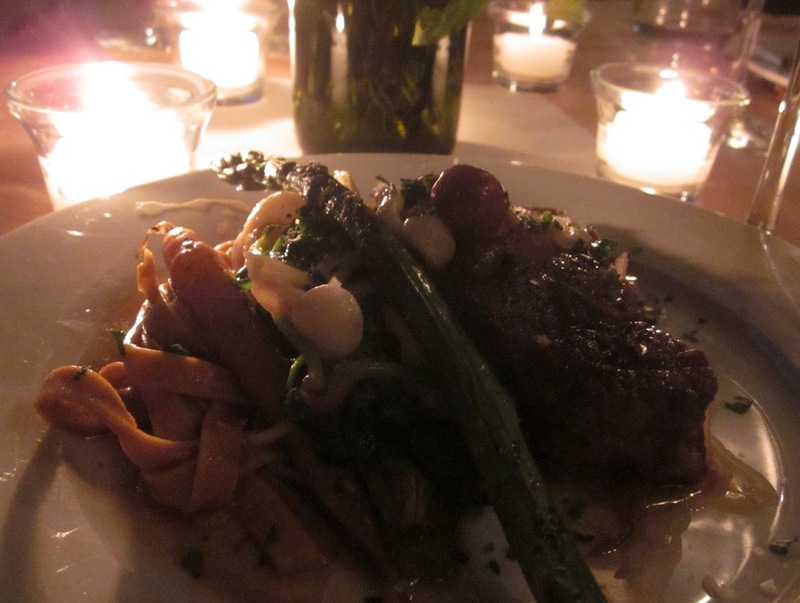 The fifth course, and Pia's favorite, was a melt-in-your mouth short rib with turnips, asparagus, carrots, and fennel served over a pepper fettucine. 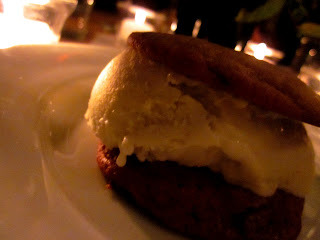 And the final course, dessert, was an Ice Cream Sandwich - two crisp, buttery chocolate chip cookies hugging a scoop of bay leaf ice cream. We laughed, we feasted, and we toasted - "to a 'shawl-free' 2012" (that was Brian); "to giggles" (Pia); "to adventure and passion" (me); I can't remember what Jake added before the group clink. Whoops. My brain was addled by too many glasses of wine. You know it's a great dinner when your friends take your camera while you're in the bathroom and take silly out-of-focus photos. We definitely were heavy on the giggles! 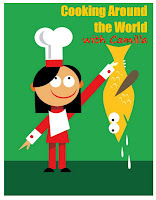 What an amazing culinary adventure! Congratulations to Brendan and Michael. 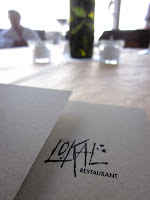 Lokal is a winner! In a mixing bowl, dissolve yeast in water; let stand 5 minutes. Add squash, buttermilk, eggs, olive oil, honey and salt; mix well. Gradually add the brown rice flour and beat until smooth. Add enough remaining flour to form a soft dough. Turn onto a floured board; knead until smooth and elastic, about 6-8 minutes. Place in a greased bowl, turning once to grease top. Cover and let rise in warm place until doubled, about 1 hour. Punch dough down. 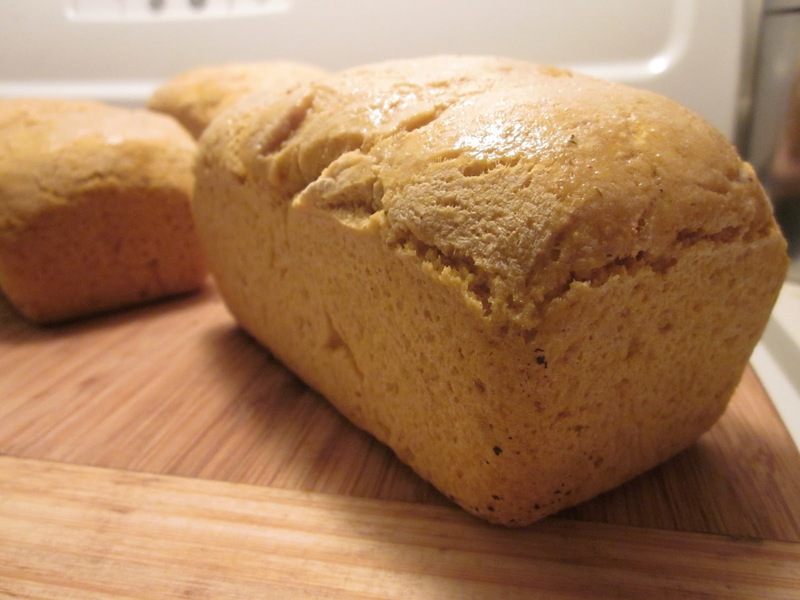 Shape into four mini loaves and place into buttered baking dishes. Cover and let rise until doubled about 30 minutes. Bake at 375 for 25 minutes or until tops are golden. Remove from pans to cool on wire racks. At this point, I rubbed the loaves with butter and sprinkled them with fennel pollen. 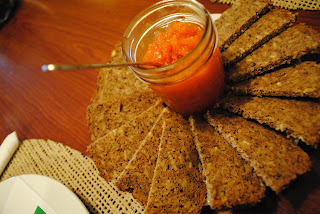 I am sharing this recipe with girlichef's Bake-Your-Own-Bread series. Go check out what others are baking. One of the really fun things about being part of a blogging community: giveaways. It's an opportunity to try out some new products and, let's be honest, it's always a thrill to receive an email that reads: "you won!" So, when one of my favorite bloggers, Heather at girlichef.com, hosted a giveaway sponsored by Veri Peri sauces I was excited to join the fray. Veri Peri sauces are made in South Africa, use the African birds-eye chili, and come in five variations - mild, lemon & herb, garlic, hot, and veri hot. All I had to do to enter the giveaway was let Heather know what kind I would like; I could also get additional entries into the drawing by liking the company on different social networks. Done. It's no surprise that I selected the garlic variety. 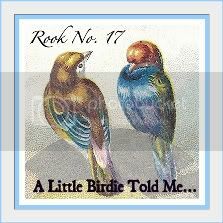 Then it was just a matter of waiting, with fingers crossed, to see which number was picked. Finally I saw the verdict. Heather posted on her blog, "Congratulations, Camilla!" Yippee. And when we came back from a week out of town for Spring break, my loot was in the mailbox - a bottle of Veri Peri garlic sauce and a festive apron. Now the quandry of what to make. I decided to braise a rack of baby back ribs in a mixture of garlic and beer then slather them with a tomato-veri peri garlic sauce to marinate overnight before roasting them to perfection. I sliced the racks into pieces that could fit in the bottom of my pans. I browned smashed garlic in a splash of olive oil then quickly seared the ribs to seal in the juices. I poured in the beer and honey, brought it to a boil, covered it, and reduced to a simmer. Let that simmer for 2 hours. The meat will be so tender that it's almost falling off the bone. In the meantime, I made the sauce by simmering the tomatoes and garlic in a splash of olive oil until the tomatoes were soft enough to smash into a sauce. Then I let it cool slightly and whisked in the honey and Veri Peri garlic sauce. Slather the ribs with the sauce and let sit overnight in the fridge. Before serving, brush the sauce all over the ribs - again - and bake, covered in foil, in a 300 degree oven till completely warmed. 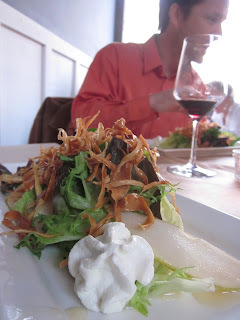 I served these Veri Peri Garlic Ribs with roasted potatoes and a crisp green salad. The ribs were tender, delicious, and full of flavor. Success! 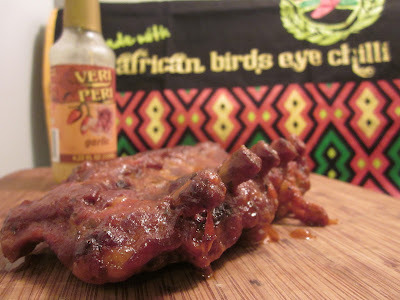 Thanks for the opportunity to try the Veri Peri sauce, Heather. My boys loved it. 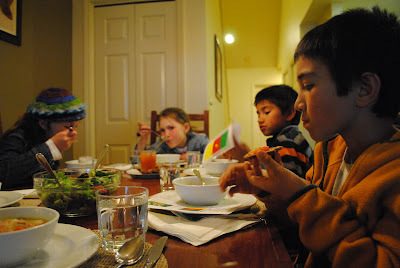 This is another dinner that we cooked while out of town last week: tabletop travel to Canada, our neighbor to the north. 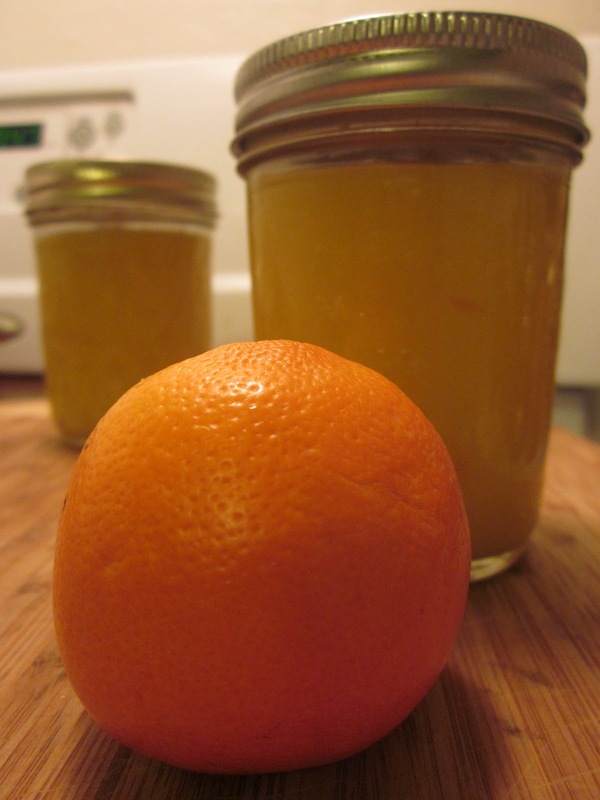 When doing some research online, I picked two recipes that seemed simple but flavorful. I picked right. Now I am not sure how authentic these are, but they were hits. The recipe that I found, unlike beef stroganoffs I've made before, was served over rice and not over egg noodles. A perfect modification since one of the kids is gluten-free. 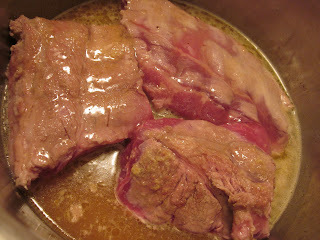 Cut sirloin and dredge in rice flour. Melt butter in a heavy frying pan and add floured meat and saute until browned on all sides. 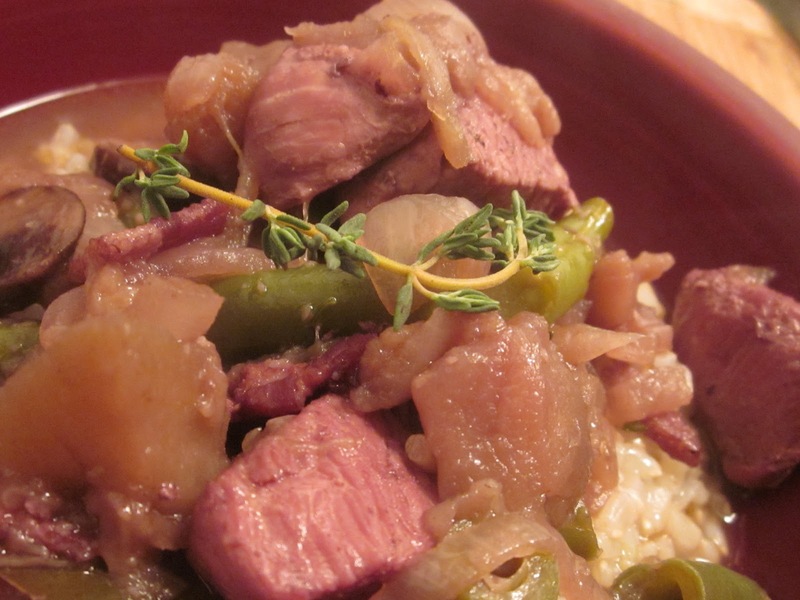 Stir in onions and cook until just tender. Add mushroom and cook until they begin to soften. Add chicken bouillon, beer, stirring constanly, until thickened. Stir in the yogurt and heat through, but do not allow to boil. Serve on hot, fluffy rice. Probably not traditional, definitely not traditional since I just made it up on the fly with what I had, I served roasted carrots with a drizzle of melted butter and maple syrup. Delish. Whisk together all ingredients except the last two. With an electric mixer beat egg whites until frothy, then beat in sugar. Continue beating until egg whites hold soft peaks. Fold into yogurt mixture. Spoon into glass dishes and chill for at least 30 minutes before serving. This Knight of the Global Table Adventure is signing off for now. We're moving through the 'C's now. Stay tuned for Cape Verde this week. While we were out of town, I picked up a bag of organic Minneola tangelos. They were not a hit. So, we brought home almost the entire bag and I have been trying to figure out what to do with them. Tonight I decided: curd. When in doubt, zest it, juice it, and mix it with butter, sugar, and eggs. You can't lose. 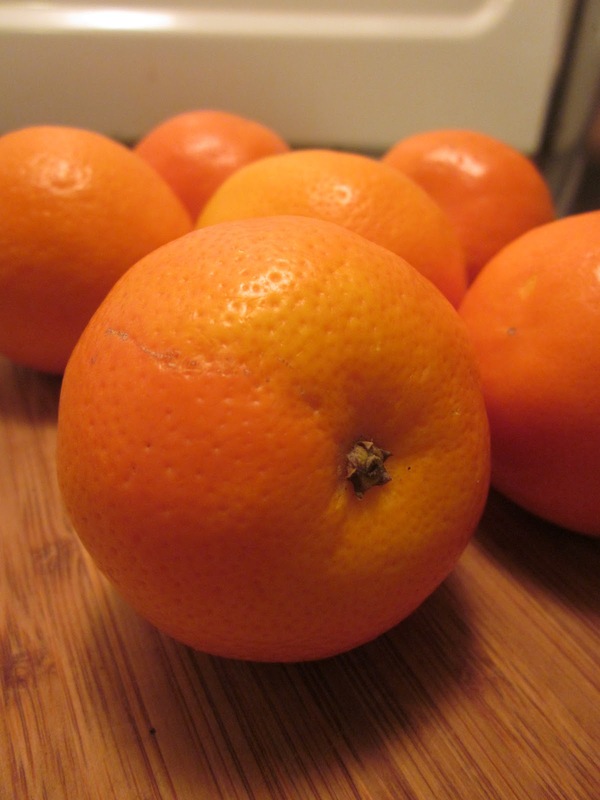 Just in case you don't know what a Minneola tangelo is, it's a hybrid of a tangerine - making it easy to peel - and a grapefruit - making its pucker power pretty strong. I've had tangelos before; the fruit in this bag seemed almost herby. It wasn't very pleasant, actually, but as a curd, it's fantastic! Zest the Minneola tangelos, squeeze and strain the juice. 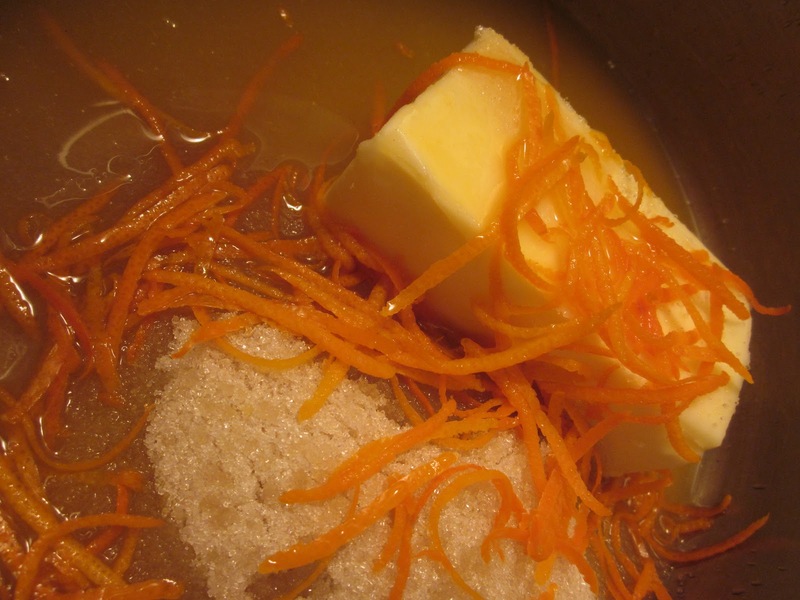 Combine the zest, juice, sugar, honey, and butter and bring to a boil. Meanwhile beat the yolks. Add 1/3 of the boiling liquid to the beaten yolks then add the mixture back into the boiling liquid. Continue beating over medium heat until it thickens. Be careful not to let the curd boil or it will scramble. 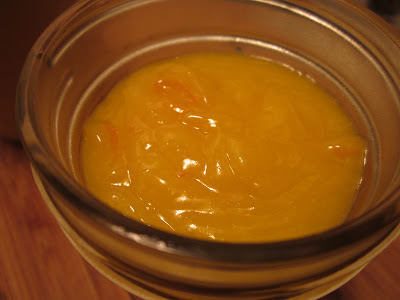 Spoon the curd into sterilized jars and keep in the fridge. More excuses...last week we were out of town for Spring Break and we had two friends along for the adventure. While I had planned the dinner, printed the menus, and purchased - and lugged - the ingredients with us, I did not fully understand what adding two more people to the table would mean in terms of time management and getting things from the kitchen to the table. So, I did not get many photos of the food before the hungry little kids dug in and began devouring everything on their plates. I guess that's a good thing...but not for my blogging. This is a traditional Cameroonian recipe for a soup of potatoes, onions and leek in a coconut base. I skipped the leeks but added carrots and celery; also, I left it chunky and skipped the blender. It was a hit. Everyone polished off their bowls and everyone asked for seconds. In a large souppot, saute all but the last two ingredients in a splash of olive oil until cooked and beginning to caramelize. Add the chicken broth and coconut cream. Bring to a boil, reduce heat, and simmer till everything is warmed through. 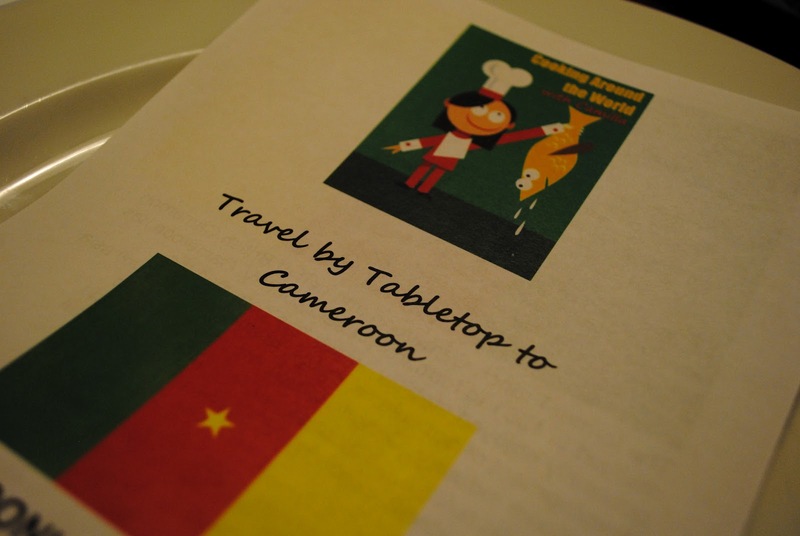 Though the papaya jam is a traditional element to a Cameroonian dinner, I couldn't find any recipes for it. So, I made up my own. Peel one whole ripe papaya, add 1/2 C tangerine juice and 1 C organic granulated sugar. Bring to a boil then reduce to a simmer. Continue cooking until all the moisture has evaporated. Spoon into sterilized jars Seal tightly and store in the refrigerator. This was, as one of the kids said, like a pumpkin pie without the crust. And since on one of our friends is gluten-free, I used brown rice flour. Blend everything together to form a thick batter. Spoon batter into a buttered baking dish. Bake for an hour in a 350 degree oven, until firm to the touch. Cool in the pan for 5 minutes before inverting onto a serving dish. Serve warm with a scoop of papaya jam on top. This Knight of the Global Table Adventure is signing off for now. We're moving through the 'C's now. Stay tuned for Canada. 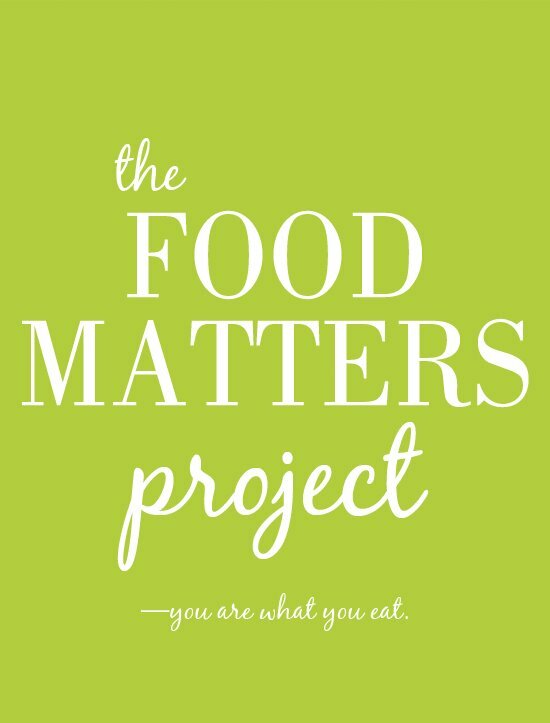 Here we are at week eight of the Food Matters Project, the brainchild of Sarah of 20somethingcupcakes and Kate from Cookie + Kate. 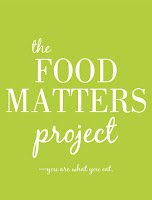 Each week we all - here's the 'we' and we've grown to just over four dozen fellow foodie bloggers - cook the same recipe, from Mark Bittman's The Food Matters Cookbook, posting our interpretations and adaptations. This week Evi + Sam of Fifth Floor Kitchen assigned us Mark's Vegetables au Vin with Coq. Here's the hosts' post. And click here to see what all the creative cookers whipped up; look in the comments section. I have never made coq au vin, and it turned out that the night I normally whip up my Food Matters Project dinner, Sunday night, is my 12th wedding anniversary. 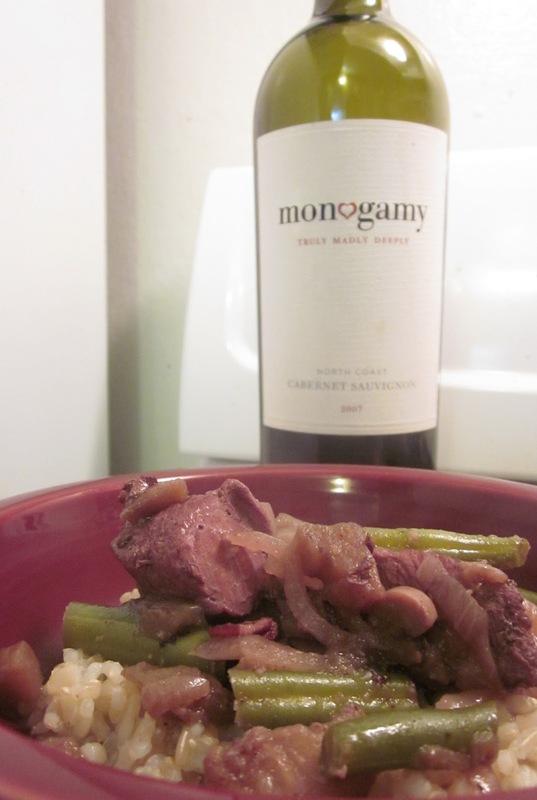 So, I pulled out an aptly named bottle of 2007 Cabernet from the North Coast: "Monogamy - Truly Madly Deeply" and made my version for our celebration dinner. Put the bacon in a deep skillet and cook until it's browned and its fat rendered. Remove the bacon from the pan and add the chicken. Cook until browned. Remove the chicken from the pan. Add a splash of olive oil to the bacon fat and add the onions, mushrooms, and eggplant. Cook for two minutes, add the garlic. Cook until the vegetables are softened. Add the stock, wine, chicken, bacon, bay leaves, 1 teaspoon of fresh thyme leaves. Bring the mixture to a boil, add the beans, reduce heat to a simmer, cover and cook for 30 minutes. Season with smoked sea salt and smoked paprika. Serving suggestions were for crusty bread, potatoes, and more red wine. I opted for short grain brown rice, but did pour more of the wine. This was a silky, delicious meal. Cheers and happy anniversary to me and the love of my life! 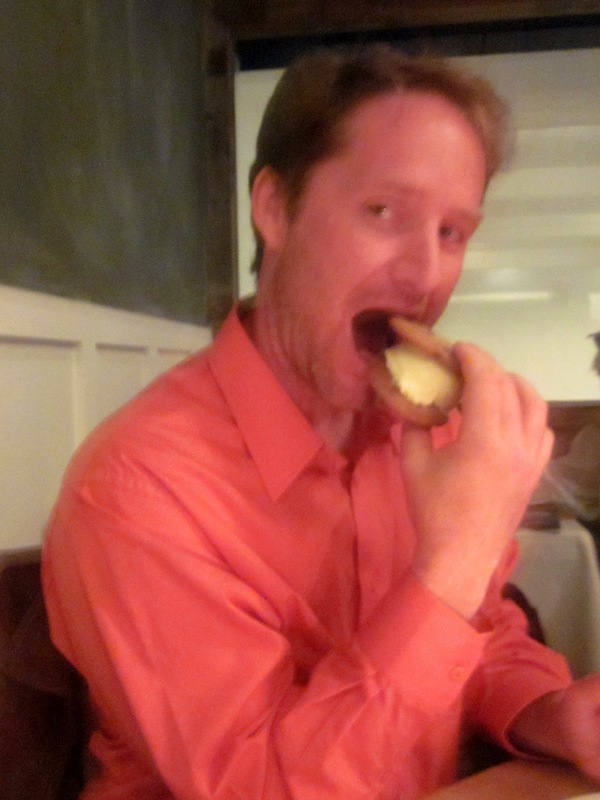 Twelve years ago today I had seven different cheesecakes as my wedding "cake." 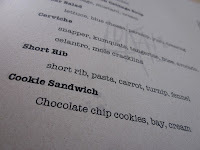 Each was topped with a tuille cookie that had a different word on it: Passion. Love. Joy. Friendship. Life... You get the idea. You would not believe how many bakers I approached who asked, "Are you sure you want to serve cheesecake at your wedding? You know not everyone likes cheesecake, right?" It's my wedding. I don't care if people don't like cheesecake! I probably sounded like a bridezilla. I wasn't, but I know what I want and I wanted cheesecakes. So, as our anniversary dessert tonight, I whipped up a mostly plain and white cheesecake. I did add some honey and lemon zest. He can deal with the added flavors, it's my anniversary, too. 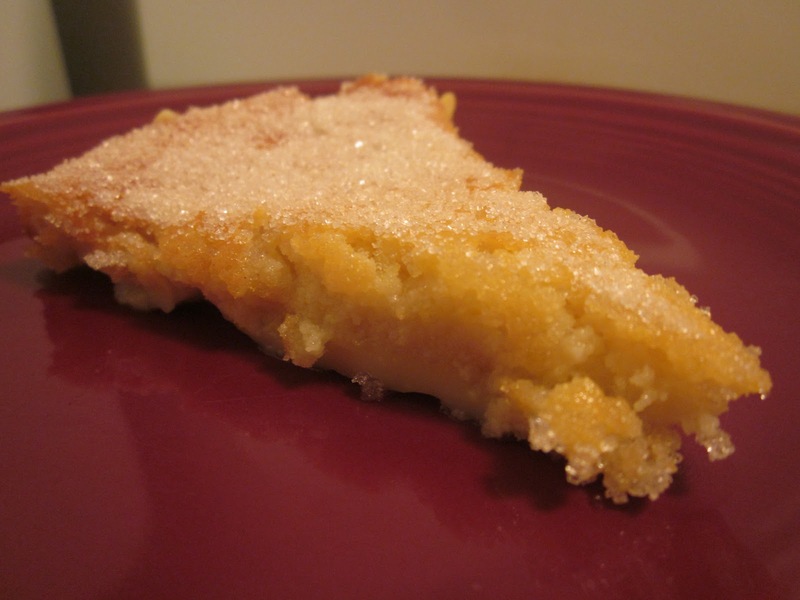 Mix all of the ingredients together until moist clumps form. Press crumb mixture onto bottom and up sides of a springform pan that's been wrapped in foil. Chill crust while preparing filling. Position rack in center of oven and preheat to 350°F. Beat cream cheese in large bowl until fluffy. Beat in sugar. Beat in eggs 1 at a time. Mix in sour cream, zest, and juice. Transfer filling to prepared crust. Place springform pan in large roasting pan. Pour enough boiling water into roasting pan to come halfway up sides of springform pan. Bake until cheesecake puffs around edges, about 1 hour 15 minutes. Turn off oven. Let cake stand in oven 1 hour, leaving oven door ajar. 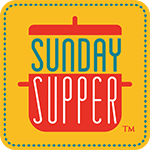 If you would like to top the cheesecake with a sour cream topping, beat together 1-1/2 C sour cream, 1 T vanilla, and 1 T organic sugar. Spread this over the cheesecake and bake in a 350 degree oven again for 5 minutes. Transfer cake to rack. Run knife around pan sides to loosen cake. Cool completely. Remove foil from pan sides. Cover cake and chill. Ideally you want to chill the cheesecake overnight. I only had today, so it chilled for about 6 hours. Remove pan sides to serve. I garnished my slice with bee pollen and candied kumquat. Green Eggs and Ham! Happy Birthday, Dr. Seuss!